Greene was there to help band chicks. Eventually, she became monitor of the birds’ nesting activity in the greater metro area. She’s been doing it for 25 years, and sees no reason to stop. She works from her Minnetonka home. She began as a wildlife technician for what is currently the Three Rivers Park District. The district was working to reintroduce the species to this area. The affects of DDT on Osprey and eagles, loss of habitat, and persecution contributed to a rapidly diminishing population of the birds. The district ended its monitoring program when it felt the reintroduction effort had reached its goals. Greene was hooked on the birds. She didn’t want to stop. She left the park district in 2008, after 15 years of volunteer work, to create the Twin Cities Metro Osprey Watch. “There are so few long-term research projects,” she told me, “and after 25 years of collecting data in a consistent manner on all known nests in the eight-county metro area, I can see no reason to stop! “I think the longer this effort continues, the more we will know about the specific behaviors of these magnificent raptors, as well as the long-term results of the reintroduction effort. Her work has value far beyond the territory she travels to monitor nests. She has published research papers in peer-reviewed journals. She has a Facebook page and a blog where she shares census results and behavioral stories. She shares information with other scientists. She hopes sharing with the public will generate interest in the natural world. She says the number of birds in her monitoring program — growing each year — spreads her effort “pretty thin.” That’s where volunteers enter the scene. 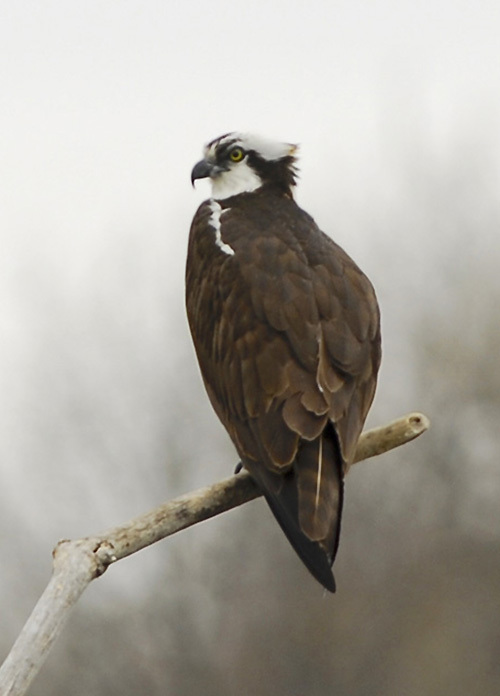 Ospreys nesting in the metro area are adapted to living near people. As evidence, you see their nests on cell-phone towers, ballfield lights, transmission towers, and other man-made structures. Greene drives over 10,000 miles each year to gather data on 135 known nests. There will be more next year. Ospreys hatched this past summer tend to return to their natal area when they migrate back here in the spring. The Osprey population is growing rapidly, she says. That’s why volunteers are so important to her work. “We need the public’s help in reporting nest locations,” she said. You also can provide help and give yourself a fascinating summer by becoming a volunteer. Greene will not ask you to drive 10,000 miles. 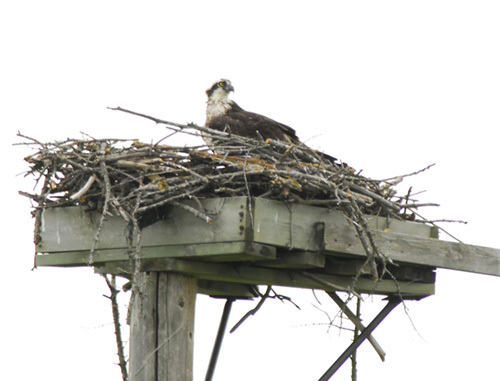 Ospreys build large stick nests, this one on a platform built for nesting. You see these in Three River district parks. Ospreys are large, dark, handsome birds. They fly with a distinct kink in their wings.